Christians around the world boast their own version of king cake, which is named for the three kings who came to honor the baby Jesus. 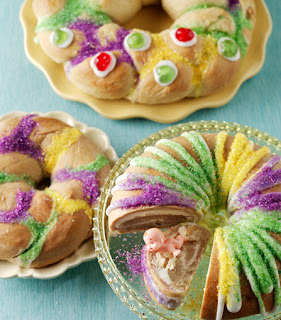 The New Orleans king cake is a round or oval coffee cake–like pastry, rolled or braided into a ring. It is traditionally topped with icing and sugars in Mardi Gras colors, with purple representing justice, gold representing power, and green representing faith. The cake may be filled with a variety of fillings, from apple or cherry preserves to cream cheese or almond paste. Krystina Castella, author of A World of Cake, has posted this delicious recipe on her web site.